if loving this is wrong, i don't want to be right. Before 2012, the only Sloppy Joe I ever knew came out of a can. It had been years since our last meeting and honestly, I hadn’t given Joe much thought since then. Joe was just a piece of the past…a cheap means to a quick end when dinner had to get on the table. It was survival cooking which I hope I have left far, far behind me. But there’s no reason for me to snub Joe now because our past relationship was not healthy. In most relationships, you can’t change your partner. All you can change is your own expectations and reactions. My relationship with Joe is one of the exceptions. Joe yielded completely to my wishes. Without argument Joe became exactly what I asked. No longer defined by a list of chemical and preservatives with dubious nutritional value, Joe went natural. I won’t lie, it wasn’t quick. It took time. And patience. But now Joe is hearty and filling on my terms. With some planning by me to identify a block of time for Joe to do his thing in the crock pot and a little work to clear freezer space for him to chill out in afterwards, I now have a healthy relationship with Joe. Without much more effort required to brown my ground beef and open a can, I still have budget friendly means to an easy meal. BAH Note: If you don’t have at least a 12 inch frying pan to work with I recommend browning the ground beef in batches. I was going to say scale the recipe down by half but these are too good not to make the whole batch and stash some in the freezer. Really. That good. I promise. Cook the ground beef in a large frying pan, working in batches if you need to, over medium heat until it is lightly browned (no longer pink). Transfer the ground beef to the insert of your crock pot, straining off and saving the juices and fat from the pan. Combine the onion, red pepper, carrots, and beef juices in a large microwave safe bowl. Cook on high power for 10 minutes, stirring halfway through. While the vegetables soften in the microwave, combine the tomato paste, vinegar, sugar, and spices in a bowl. Stir until they are thoroughly combined. Add the softened vegetables and tomato paste mixture to the crock pot, stir to completely combine all the ingredients, cover, and cook on low for 6 hours. The blog is like greatest hits from my childhood this week. First deviled eggs, now sloppy joes. Dear Wendi, are you featuring spam on Friday? You dont know how much this made me smile. I can say there will be no spam on BAH. That was a low point of my childhood meals. Spam with white hominy from a can. That’s just wrong. sloppy joes really are the best, aren’t they? add in some tater tots and i’m whimpering in nostalgia. How could I have forgotten about tater tots? I am making a batch of sloppy joe this weekend. Will have to throw a bag of tots in my grocery cart to round out the meal. I am a sloppy joe lover! My mom always made them growing up. I’m definitely trying these! Do it. Pass on the sloppy joe love to your girls. Hugs to you and your mamma. I have bad childhood memories of the ole Sloppy Joe . . . I think it would take this natural approach to heal those wounds. 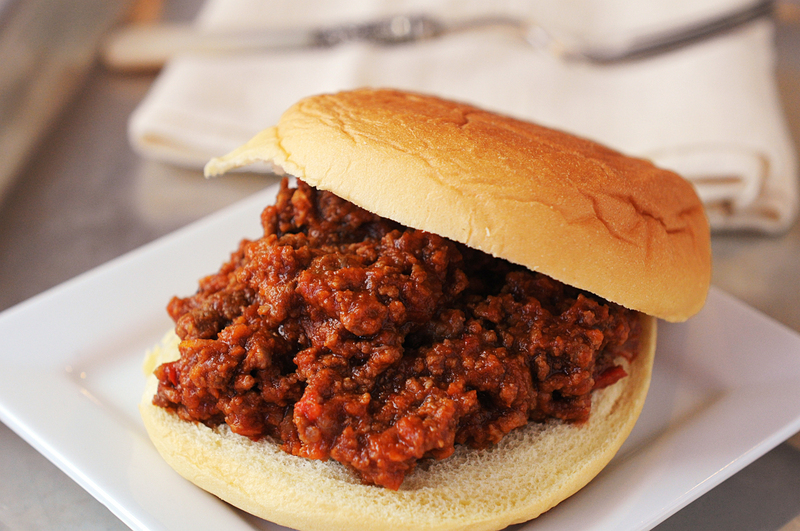 Jenna, this is everything sloppy joe should be. I want this for dinner. Tonight. One of the best gifts my hubby ever got me was a slow cooker with an insert that can be used on the stovetop so I can brown beef (and other things, but usually beef) right in the slow cooker! This will be hitting the dinner menu at my place next week. You can be sure of it. Jen, I’ve got my ground beef defrosting in the fridge as we speak because Sloppy Joe and I have a date this weekend.� I bet Joe would be even better on one of your homemade rolls! Thanks for such a great recipe idea. Question — 3 Cans of paste? That sounds so extrememe – before I invest in this, can you confirm that amount? Did that amount scare you as well? lol!!!! Three cans does sound like a lot but remember, each can is only 6 ounces. I used all 18 ounces and didn’t think it was too much in the final product. Hope you enjoy. I do not thing I have made sloppy joes since we moved to Asia. Thanks for the nostalgia and I might have to make some this weekend. I suppose if you had a large enough frying pan, you could try that. It’s not that much more work to soften the vegetables in the microwave after the beef browns though.